Happy Monday! It's also a happy Monday at Altenew as today marks the start of a fun blog hop to celebrate the release of 15 new dies, 12 new ink colours, 36 re-inkers and two wonderful, sparkly glitter tapes! You should have arrived here from Svitlana Shayevich, if you haven't then be sure to start out at Altenew HQ! For my final project, I kept things pretty simple. After stamping and colouring the presents from the Celebrations stamp set, I then used the co-ordinating die to cut it out and mounted it onto a woodgrain card front using 3D foam tape. Easy peasy! 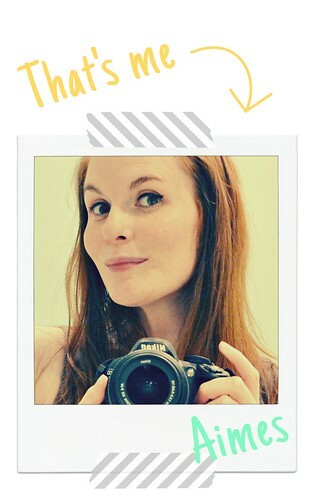 I hope that you're enjoying the blog hop so far! Don't forget that it's worth commenting along the way as Altenew are giving away three $50 gift certificate to one lucky person commenting on the Altenew blog and I'm giving away a $30 gift certificate to a lucky peep who comments on this post! Please leave your comment here by Friday September 23rd 11.59pm EST to be in with a chance – I'll announce a winner on Saturday 24th September. Gah! They are all so freaking amazing! LOVE how you featured the new Emerald ink colour - it's gorgeous and creates the perfect negative BG for those diecut letters! Two amazing cards. Wonderful card designs and very inspiring! I love the emerald too. And you celebrate card is so cute. Your cards are gorgeous. Thank you for sharing. Aimes, I always love your cards and I love these too! Awesome cards... great backgrounds! Love the new colors and the bold letters. I'm so happy to see the re-inkers!!! Thanks for sharing and a chance to win. Love the Bold Alphabet die set...many possibilities. Aimes, I love the new colors you used on your cards. The colors really worked great with your designs. Thank you for sharing. This is gorgeous, Aimes! Love the woodgrain and ombre background. The new inks are on the top of my wishlist! Love what you have done with these new colours and those large alpha dies! Both cards are lovely. Love the simple elegance of the second card and I love the use of the alphabet dies on the first. Since they are large, I was wondering how best to use them. Great blog hop! Two lovely Cards. Great colouring, I really like the woodgrain pattern on the first. Love your cards - thanks for the inspiration! What a sweet card, your coloring is superb! Wonderful card designs with these new products. Wonderful cards! I love the colors and especially the pink background of the first one! Thanks for sharing! Beautiful cards. Love them both! Love those new letter dies and the way the look on your card! So cute! I love the idea of using the letters as a background stamp. Very clever. Fun cards! Thanks for sharing on the blog hop!! Both your cards are beautiful, I love the look of the woodgrain panel stamped in the emerald ink, it looks amazing with your front panel blended so beautifully and those letters are awesome. I ordered the new ink color sets. I want to use them to create the ambre' effect. Aimes the cared are so cute. Thanks for sharing. These cards are just plain awesome, always a big fan of your work! Your cards are great! I love the bold alphas and the new colors. Such fun cards. Really loving these new colors. Love the woodgrain background and ombre front they are very eye catching with the bold alpha dies! Wonderful cards! I Can not wait to get the new ink colors! Beautiful job on your cards. Love the colors you chose, very pretty. Thanks for sharing! 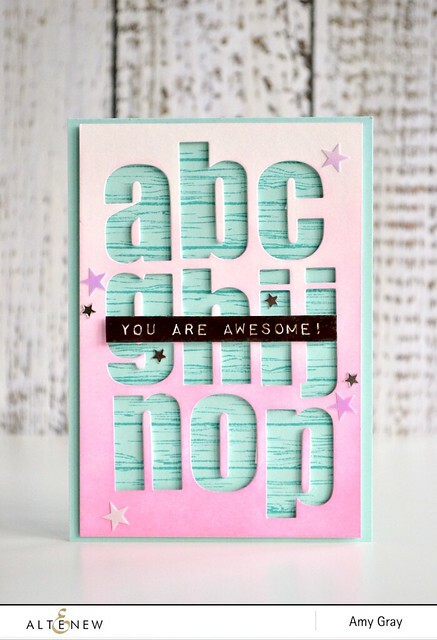 I'm smitten with the clean design of your alphabet card and how fabulous the new ink colors are! Both cards are lovely and perfect. Love the wood grain! And the alphas as a group - so perfect! The woodgrain background makes those letters pop and I love the clean look of your second card. Altenew just keeps the good stuff coming and I am in love with the new inks and other products, too! Love your cards, Amy. Great cards. Just love Altenew!!! Gorgeous cards! I love the new ink colors and dies! Beautiful cards! Love those gorgeous colours in your ink blending! Such pretty cards! Love the new ink colours! What fun and different cards beautiful! Awesome cards for this latest release!! I love the new ink colors - thanks for the chance to win. The alphabet card is wonderful. Love the soft colors and fun feel to your cards. Lovely! Great cards, I love those alphabet dies! Great cards. That alphabet set is so much fun. Love the new ink colors, they r a must have! fun way to use those letters! Both cards are awesome in colors and design! 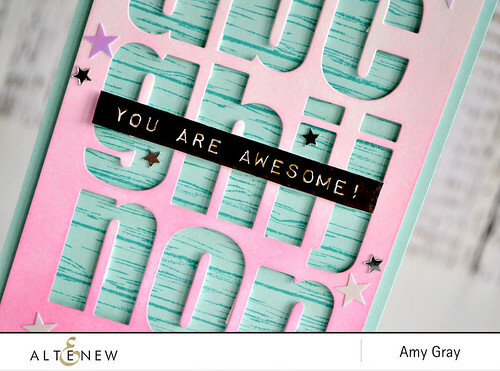 Great new things from Altenew and you have showcased two of my favorites - the new bold alphabet dies and the gorgeous green emerald ink. Aww-dorable! I love how the wood grain looks on the alphabet! I was surprised! You're right about that color, it's beautiful! I'm sure the other inks are green with envy! Thanks for sharing your creativity! 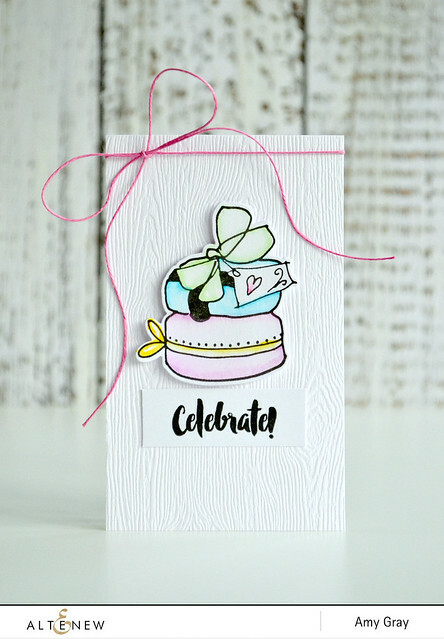 Love the alphabet negative die cut with the wood grain background, and the soft colors on the birthday cake, beautiful cards! Just fabulous! Can't choose a favorite. Beautiful cards Amy.. love the soft colours. Altenew rocks. Such fun cards! Love the subtle colours of the first one and the clean crisp look of the second. Wow! Beautiful cards and colours!!! Wonderful cards. I have to agree that emerald ink is delicious. Super cute cards Amy, that alphabet set is amazing! Beautiful cards, the second one is awesome I love it! Great card designs. Love that emerald color too. Thanks. Lots of goodness here. LOVE that ombre pink paired with the aqua. It doesn't get any better than big, bold and graphic. But, alas, it does. All the fabulous white space on card #2. Delightful! Yes, no doubt I love those new colors too ! And you exactly know how to highlight the new products ! Thanks so much for sharing. Great cards & layouts...really loving this release! What fun! I'm never quite sure what to do with alphabets but this is an amazing idea! Love your cards, especially your alphabet card...I'm going to have to get the alphabet dies! Beautiful cards! Excited about the fabulous new colors and dies! Awesome alpha dies and love your sweet macaron card! Cute cards. They look like they are fun to make. Anyone would feel privileged to receive them. My favorite was the presents card! Great cards. Love the ink blending on the first one. Two fabulous cards Amy! Love all of the new die sets. Thanks for the inspiration! Fun cards. The first one feels so different to me. Love the colors! Such fun cards - love your delicate ink blending! Great card designs! I really love the bold alphabet die set! Great cards! Thanks for the inspiration and for the opportunity to win! Gorgeous ink blending on the first and love the simplicity of the last. Love your celebrations card. So cute! Thanks for the chance to win! I never think to use the negative of a die cut! Such wonderful cards! I especially love the second one. Ooohhh wonderful cards. (BIG SIGHHHHH) wondering if I will be as good as this one day. Fingers crossed I will be. Great cards - and a fabulous new release. Love it all. Such a fun release! I love how you used the colors in the alphabet card. They are so pretty!! Wow! I love the alphabet letters against the beautiful background. Very cool! Love the colors you used on both of your pretty cards! Great way to get 2-for-1 for your crafty efforts....a diecut background and diecut letters when you need them. Wow, I love these both! Great job using the alphabet die cuts ... so effective! i love your simple but bold cards! Love the new alphabet dies - fabulous cards using them. The celebrate card is my fave. I love the colors and how delicate it looks. I love alphabets and yours is so nice. I don't have a die cutter but I like how yours came out. Nice job! These are beautiful! I love that paper you chose showing behind the negative cuts in the first card! I adore the first card and the coloring of the letters is amazing. Love the simplicity of the second card and the white background. Very pretty. Beautiful cards!! Love the use of the negative space! Gorgeous cards Aimes, I agree those bold alphas totally rock! 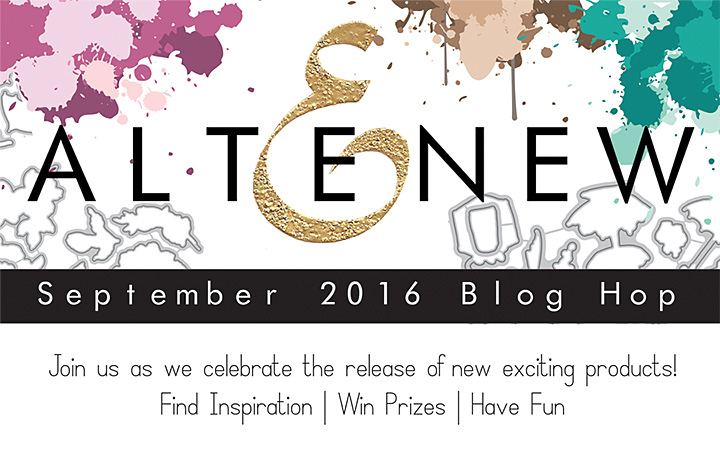 Altenew September Release Blog Hop Winner!